TC72 is a digital temperature sensor capable of reading temperatures from -55°C to +125°C. The sensor features a simple, SPI compatible serial interface that allows communication with a host controller or other peripherals. 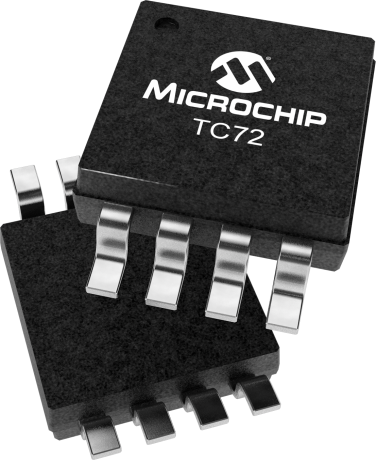 The TC72 does not require any additional external components. Temperature data is measured from an integrated temperature sensor and converted to a 10 bit digital word with a Sigma Delta Analog to Digital Converter. The temperature resolution is 0.25°C per bit. The TC72 can be used either in a continuous temperature conversion mode or a one-shot conversion mode. The continuous conversion mode measures the temperature approximately every 150 msec and stores the data in the temperature registers. In contrast, the one-shot mode performs a single temperature measurement and returns to the power saving shut down mode. The TC72 features high temperature accuracy, ease-of-use and is therefore the ideal solution for implementing thermal management in a variety of systems. The device also features a shutdown mode for low power operation.